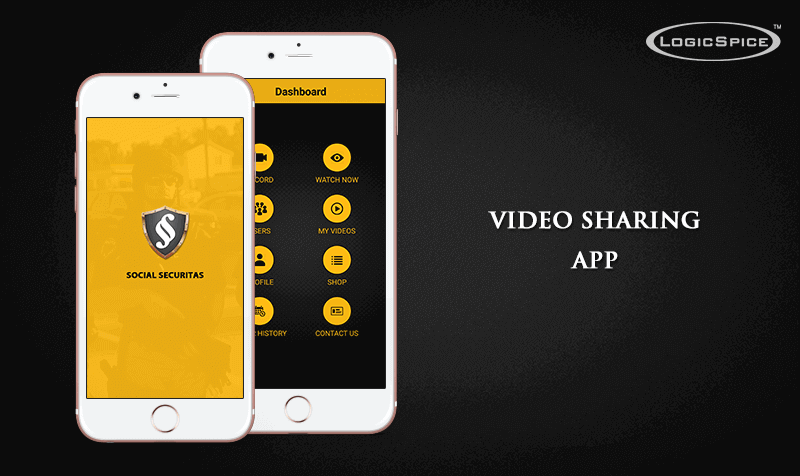 Social Securites app that will scoping for “Video Sharing Apps (Android & iPhone)” that will facilitate users to upload and share videos over the apps. This apps will facilitate users to register and login also using Facebook and Google accounts. They will be able to edit their profile details over apps. They will be able to record videos and their location will be tracked using GPS. They can upload videos (in .mp4 format) from their devices over apps which will be automatically uploaded over the apps. They can watch videos uploaded by other users over apps and can play those videos over apps. Users can then also send link of the videos to the emergency contacts with location of the recorded video as watermark. They can also download the videos over app by paying a specific amount by integrated payment gateway (PayPal). Further users will also be able to view items listed by admin for selling over only app and can then purchase any item by making online payment. Website will facilitate users to only to watch videos uploaded over the applications (Android & iPhone). Admin will be able to manage the apps through website backend panel and admin can add/manage items and can deliver the item manually to the users. Users can rate the app as well. We will open a pop-up and it will direct users to google play store. Social Securites choose LogicSpice for its ability to develop for complex websites. The motto of the proposed app solution is that users to register and login also using Facebook and Google accounts. They can record videos and their location will be tracked using GPS. They can watch videos uploaded by other users and can play those videos over apps. They can also download the videos over app by paying a specific amount by integrated payment gateway (PayPal).